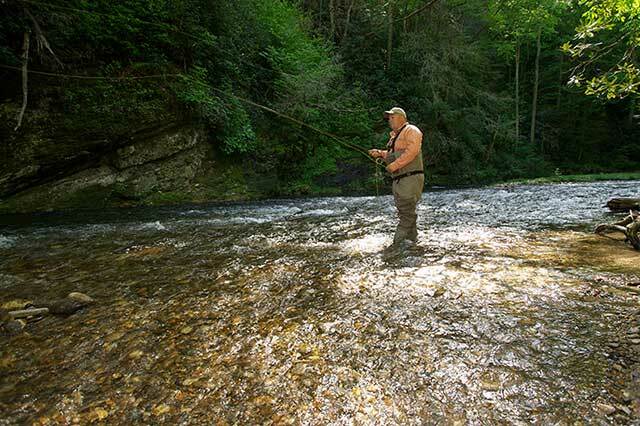 Folks ﬁshing in the Tar Heel state aren’t much different from anglers anywhere who are looking for a little soli­tude and a chance to connect with nature. Regrettably, opportunities to get away from work seem to be harder and harder these days, and a lack of access to prime ﬁshing locations is a genuine concern for anglers and ﬁsheries managers alike. Unfortunately conﬂicts between the angling public and riparian land owners are becoming more frequent, and reports of anglers becoming embroiled in legal issues concerning river usage are becoming more common. While we tend to think of the more populated states in the East as having the most access issues, similar issues in states like Utah and Montana are currently working their way through the courts. The main thrusts of these cases are trying to determine just where the public has access to state rivers and where they may go once they’ve entered those waters. The primary thing to remember as we look at access is that it is a very complicated issue. Whether he’s afloat on a river or wading it, what an angler thinks he knows about access might be right, but also might be incorrect. It is incumbent on the angler to ﬁnd out what the laws are for where he intends to ﬁsh. Determining what rivers are navigable or non-navigable is important to states as well as the federal government, and thus Congress set up a mechanism to determine this important distinction on a broad national level. One of the main purposes was to assist the country in developing trade with foreign nations; clarity was needed to determine who would have jurisdiction over harbors and ports. Section 10 of the Rivers and Harbors Act of 1899 gives the Army Corps of Engineers (ACE) broad authority to deem a river navigable as far as the federal government is concerned. Once this rating has been made it can never be revoked unless done so by a federal court. It is important to note further, that this applies only to the river’s surface; the ownership of a riverbed is dictated by state law. However, this becomes confusing for sportsmen since individual states often have a different deﬁnition of navigability than the ACE. Generally speaking, rivers are broken into two broad categories of being navigable or non-navigable. According to the ACE, navigable rivers are ﬁt for commercial use or have been used for commercial purposes in the past. The Mississippi River is obviously navigable, although navigable rivers need not be so large. In the past, loggers often used rivers to ﬂoat timber downstream, and so many states contend that rivers used in such a way in the past are therefore deemed navigable. Examples of navigable rivers in North Carolina according to the ACE deﬁnition would be the Cape Fear, Neuse, New and French Broad rivers. According to the ACE, non-navigable rivers are generally much smaller in size and are commonly seen on farmland, but are certainly large enough to ﬂoat watercraft like kayaks. In many cases such waters have fences across them to contain cattle or divide property. While you may be able to ﬂoat your kayak or canoe down a non-navigable waterway in some states, this doesn’t apply in every state. In Virginia, for example, if a river doesn’t carry a “navigable rating” from the ACE, it doesn’t matter if you can ﬂoat a kayak or canoe on it or not, you’re not allowed to paddle there, much less wade on the river bottom. Most states recognize the ACE as the prevailing authority on the issue of navigability; states may retain the right to deal with the riverbeds themselves, however, which is why riverbed ownership has become such a big issue. If a state owns the riverbed in trust for the public, then the public is free to walk or ﬂoat up and down the river as long as they stay in the river. Again, if the river is non-navigable, you may be trespassing without knowing it, which is why I recommend avoiding non-navigable waters without the permission of the landowner. Even if you are ﬁshing a navigable waterway, once you get out of the river and venture onto dry land, all bets are off. So in a straightforward reading of this case, if you can ﬂoat a canoe or kayak on it, it’s open to public ﬁshing. More insight about what is and isn’t open to the public as it applies to kayaking and ﬁshing in North Carolina can be found in a letter written on Jan. 20, 1998 by Dan C. Oakley, senior deputy attorney general, to Richard Whisnant, who worked for the N.C. Department of Environment and Natural Resources at that time. While the letter isn’t an exhaustive explanation of all the rights citizens of North Carolina might have, it is very instructive as to who can use the river and how. Mr. Oakley responded: “The answer to your question may be summa­rized as follows: Yes. Citizens have the right to travel by ‘useful vessels’ such as canoes and kayaks, ‘in the usual and ordinary mode’ on waters which are in their natural condition capable of such use, without the consent of the owners of the shore. “Under the public trust doctrine, as applied in North Carolina, citizens have the right to use the state’s navigable waters for the exercise of public trust rights, without the consent of riparian owners, i.e., the owners of the land adjacent to those waters. Public trust rights are deﬁned by common law, and ‘include, but are not limited to, the right to navigate, swim, hunt, ﬁsh, and enjoy all recreational activities in the water­courses of the State and the right to freely use and enjoy the State’s ocean and estuarine beaches and public access to the beaches.’” N.C.G.S. 1-45.1. The letter ends by admitting there are some limitations that apply even to those waters on which pleasure craft can go at a certain point. “It is not possible to say with conﬁdence how far up a watercourse public rights may extend. At some point, navigability ‘in the usual and ordinary course’ ceases, and public trust rights give way to those of private property. As the Supreme Court noted in State v. Baum, ‘[w]e are not prepared to say that a land owner would be liable to criminal prosecution because he happened to put a watergate across a creek up which otherwise an idle hunter might be able to pole a canoe…’” 128 N.C. at 604. This raises an issue that is key for wade-ﬁshermen, who often ﬁsh non-navigable waters: when does a river cease to be navigable? The answer, if there even is one for every river, or indeed, any river, is murky and possibly fraught with concerns for the angler on foot. Again, the best course is to seek permission from the landowner if you are at all concerned that you might be on private property. Property rights are important to everyone and are enshrined in the U.S. Constitution. North Carolina state law also speaks to this issue directly in state code G.S. 14-159.7, better known as the Landowner Protection Act. This law provides landholders a means to post their property and require permission dated within the past 12 months, signed by landowner or lessee, to hunt, ﬁsh or trap game. 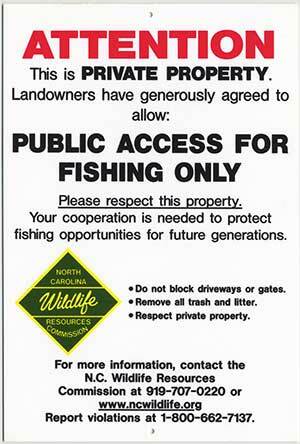 Even if navigable water which is open to public ﬁshing can be easily observed from a public road, state law forbids you from crossing private property to get there without landowner consent. You must enter at a public boat ramp, or some other legal access point. The answer to this question isn’t as clear as it may appear. Yes, rivers that are navigable by state law are held in trust; non-navigable rivers, as we’ve discussed, can be privately owned. When a river’s navigability is in question it can result in legal action where “a ﬁnding of fact” is determined by a local court as to what is open to the public. When anglers simply “assume” something is navigable rather than requesting landowner permission, negative outcomes can occur. The agency is constantly on the lookout for new opportunities, and several years ago purchased a portion of Wilson Creek from a land­owner in Caldwell County for public use. Anglers wishing to ﬁsh in North Carolina and in particular the western part of the state are in luck. Since angler access ranks as a high priority with the Wildlife Commission, the agency has worked closely with landowners to ensure as much public access as possible. 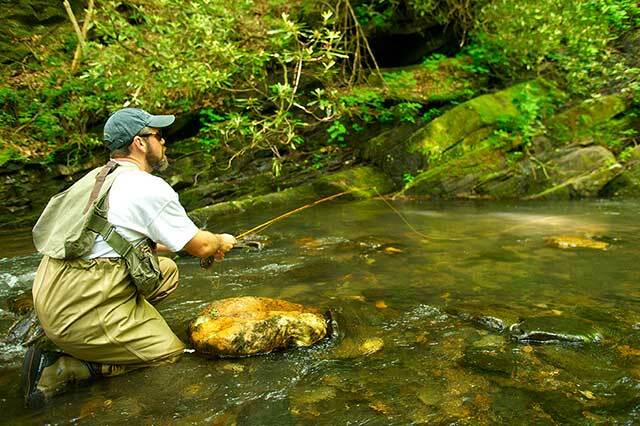 Tar Heel sportsmen may be surprised to learn that NCWRC Public Mountain Trout Waters program has nearly 800 miles of privately owned streams that are stocked and open to the angling public at no charge. This means nearly 80 percent of the stocked trout water in the state is stocked in rivers or streams owned by private individuals. What Happens in a Conﬂict? Innocent acts of trespassing on private property do occur each year, but this is not an excuse nor will it be a defense should you have to go to court. This is why being certain of where you can ﬁsh legally before you go is so important. If you ﬁnd yourself in a situation in which a law enforcement ofﬁcer asks you to leave a location, do so immediately. Be sure to ask for the law enforcement ofﬁcer’s card so you can follow up later after checking with the NCWRC. They will be glad to assist you in ensuring that you’re on public property, or have a right to ﬁsh in appropriate locations. It’s possible that local law enforcement ofﬁcials were working with incomplete information. This is why asking for the ofﬁcers contact information is important. With this information in hand, you can follow up with the local sheriff’s ofﬁce later once you’ve veriﬁed you were indeed on public property or had per­mission to ﬁsh on that particular stream. Before heading out to any waterway to ﬁsh this season, be certain you’ve obtained the proper ﬁshing licenses and know the rules and regulations of your destination. Check to ensure that you’re ﬁshing on property that is either publicly owned or private property the state has entered into an agreement with that allows for public ﬁshing. When ﬁshing private property with permission, be sure to park in the appropriate location and close any fences you may need to open. In addition, you should make sure that you carry the permission with you. Permission slips are available at ncwildlife.org on the trout page. Also report any damage to gates or fencing that you see to the local landowner, and pick up any trash you might encounter while on stream. Lastly, if you see what you believe might be illegal activity like poaching, report the matter to the Wildlife Commission by calling (800) 662-7137. Last but not least, if you do encounter someone that seems agitated by your ﬁshing or threatens you; contact your local law enforcement ofﬁcials. Keep your cool, and remember you’re only there to slug it out with the ﬁsh. This piece first appeared in Wildlife in North Carolina, which is part of the N.C. Wildlife Resources Commission and has been in publication since 1937.